Although providing high-quality care with improved outcomes remains the primary concern of all healthcare stakeholders, money matters; the maxim “no margin, no mission” still applies. The foundation of strong financial health lies in effective management the cash conversions cycle and strong internal management is the basis of an enhanced revenue cycle. In practical terms, effective management means understanding the process and targeting the core of the revenue cycle in order to fine-tune and support fiscal health and business growth. 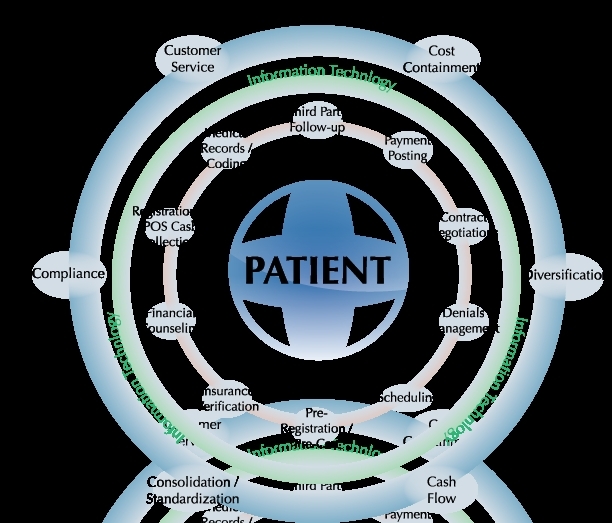 The processes of revenue and cash conversion cycles are grouped in three areas corresponding to the journey of a patient through the medical office or clinic system: the front door, the middle, and the back door. 1. Front-door processes: are termed patient access functions and revolve around scheduling, registration, pre-check-in and office access. When these processes are streamlined, the value is most evident to patients; but it is also vital to the revenue maintenance (and enhancement) of the practice. The most effective and efficient time to accomplish patient access activities is when patients and their caregivers are together. Patient access needs to be handled by highly skilled and motivated employees who can accomplish the office’s goals for information capture while carrying out patient service objectives. This is also the optimal stage for achieving denial management. 2. Middle processes: include disease management [DM], case management [CM] and health information management systems (HIMSs). Those involved act as gatekeepers to review the appropriateness of physician referrals and ensure financial clearance is established. CM and DM also involve developing a plan for monitoring to ensure it is timely and appropriate to the level of care. The HIMSs functions revolve around document management, coding, transcription, and charge capture. Financial performance can be significantly improved when case management and HIMS activities are optimized by using information technologies that are integrated with process and workflow. The end result can be an increase in revenue and reduction in regulatory risk. 3. Back-door processes: are termed patient financial services (PFS) functions and revolve around coding, billing, collections, follow-up and resolution. These are administrative functions that support the front-line caregivers and interface with external payers and patients to resolve outstanding accounts receivable. Back-door processes bring significant value by reducing administrative costs, increasing collections levels, and dramatically lowering the percentage of aged accounts receivable. Practitioners and medical facilities seeking to improve their bottom lines through better-managed and enhanced revenue cycle operations in these three areas ¾ front, middle, and back ¾ usually encounter challenges with people, processes, and technology. Mr. Johnson was the chief financial officer (CFO) of a 222-bed teaching hospital in southern California. He recognized a host of problems with the processes within the various revenue cycle departments he managed which impacted cash flow for the facility. So, Mr. Johnson met with the hospital chief executive officer (CEO) to express his concerns and the fact that he felt his existing staff did not have the expertise to fix many of the problems they were facing. Ms. Thomas, the hospital CEO, agreed with Mr. Johnson’s evaluations and concerns and the two prepared a package for the Board of Supervisors to submit a request for proposal to several revenue cycle improvement vendors. This request was approved by the Board and sent to several vendors with known successful track records in this area. During the next several weeks the responses were evaluated and a final vendor selected. It was determined through a Revenue Cycle Performance Evaluation completed by the vendor prior to the kick-off of the engagement that the largest opportunity for improved cash would be to address the bottlenecks in the cash flow, the excessive days in accounts receivable, the backlogged accounts in denied claims and improved process through the entire revenue cycle at this public hospital. When the engagement began, the net days in accounts receivable were 103 and the time from discharge to final bill was 33 days. The vendor was engaged for a four-year period to provide cash acceleration and revenue cycle improvement on a “pay for performance” [P4P] fee structure. A historical review of the hospital’s financial data determined an average monthly collection amount (baseline) the hospital was achieving each month prior to the start of this engagement. The P4P fee structure required the vendor to reach the baseline each month before the hospital was required to pay any profession fees for the services of the vendor. – reduced days in accounts receivables? – streamlined revenue cycle processes? – better trained existing staff? * Costs of dental treatment are a small fraction of hospitalization. * Dental emergencies are not usually life threatening, even if painful. * Patients readily recognize bad dentistry, sometimes even as it is being performed. Some dentists, and physicians opine that managed care dentistry [medicine] is simply dentistry [medicine] provided by the lowest bidder – with little to no quality control – an unethical/specious business foundation that ultimately leads to the abandonment of patients’ interests. Of course, this is not a new hue and cry against managed care precepts. * Maybe these lower rated dentists are not as bad as the reviews describe. * Is it possible that a few vocal people who expect discounts are impossible to satisfy? * How fair is that to a young dentist – just trying to scrape by anyway possible? * What dentist can maintain professionalism indefinitely in the financially thank-less environment of managed care? * What about the future? Participatory health 2.0 is the philosophy where patients, providers, and payers interact collaboratively and competitively in order to enhance quality medical services at value-driven prices in the most appropriate venue and time. Dr. Oogle, and other PDRS sites are imperfect tools that in many respects seeks to further this goal. Nevertheless, although metering tools will undoubtedly improve going forward, caring and competent medical and dental professionals need not fear them. You earn your living by providing medical care. But, you must collect it first! While a few doctos can run boutique practices, much of healthcare has to deal with third party payors. * medical audits; just to mention a few. a. “Estimated Useful Lives of Depreciable Hospital Assets.” Revised 1998 edition. American Hospital Publishing, Inc. 1747 West Hubbard, Chicago, IL 60622; (800) 242-2626. http://www.aha.org. b. “The Official ABMS Directory of Board Certified Medical Specialists.” (annual) Marquis Who’s Who. Reed Elsevier, Inc. 121 Chanlon Road, New Providence, NJ 07974; (908) 464-6800. http://www.abms.org. 1. Train staff to handle exceptions: What is your policy if the patient payment is significant? Will you allow 25% payments—one today and three over the next three months? Communicate your policy to all staff. What will you do if a patient shows up without an insurance card? There will be other exceptions. Train employees to call the appropriate practice-management contact when an exception does not fit in the categories you provide and make sure those managers are responsive. 2. Understand that not everyone will shine in collections. The value of this new front-desk function should be reflected in job descriptions and wages. Track staff performance and hold employees accountable for collection goals. The most successful practices collect in the 90% range. 3. Provide professional signage that states your basic policy: “Payments are due at time of service.” Avoid typewritten statements on invoices.